A busy year has passed while this sheep scoped out the competition. I even had a chance to talk with one candidate who admired my campaign and wanted me on their Veep waiting list. Unfortunately, that is not to be so this sheep’s journey continues. This race is proving to be more interesting than Cannonball Run II! My next prospect is a bird with polarizing views on some of the hot topics. He has said as Veep that he will fight for the common folk, no matter how fowl. He will keep an eye out for the little birds, sheep, cats, people… all the things! Foreign Affairs – He is from the most far away place compared to everyone else. He’s seen a lot of stuff. Energy – He understands the needs of the people with all of their toys and whatchamacallits, yet he knows we can go too far and must find balance in the Force. Youth Fitness – A little more waddling couldn’t hurt, ya know! Mass Transit – Tobogganing can only take you so far. Bring on the zooms to bring us uphill for another go! Defense – He understands the necessity and wants the world’s oceans safe for migratory vacation plans. An interesting specimen indeed. Take care, my friends, and keep those campaign [bacon] donations coming. While others are just announcing their intentions for the Presidency, this sheep has been there, done that. And this sheep has been busy looking for Vice Presidential material. Furry, Not-So-Furry, Poly-Fill. I don’t discriminate. I have recently sat down with Moonpie, a cat with no issues telling how it is. Moonpie tells me of a country where ham is plentiful and desks are clutter-free (for sits, of course). She also told me of her stances on the issues. Foreign Affairs – Once tried to negotiate with foreign dignitaries (a mouse) to reach an agreement to leave our sovereign nation with no repercussions. Energy – She tries not to expend too much of it. We need to save for the future. Youth Fitness – Apparently this is not an issue. The younger cats in the land run around too much. See stance on energy conservation. Mass Transit – Will it bring ham faster? Then bring it on. Chicken too. Not turkey though. Unless I want hairballs all over the Meep House floor. Defense – Moonpie contributed to 1 more mouse (after failed negotiations) than the rest of the candidates to keep the peace within our nation. My interview was cut short due to her leaving for an “important meeting.” Hmm! More choices to come! Stay tuned and leave the bacon at my door. It’s been a while since my first blog when I announced I would be running for President. Who knew there would be so much preparation, so many folks to meet, so much paperwork, and so little bacon! This process could stand to be more flexible. And that is one thing I will strive to do – cut the fat! From the bureaucracy, that is. We’ll keep the fat on the bacon. This sheep is not into crazy-talk! Anyhow, since this sheep is new to the game, I am seeking candidates for my running mate way in advance. I have talked to a few acquaintances to ask for their help herding some possibilities but I am here to ask YOU – my constituents – to toss some names into my woolen hat. If you give a suggestion, I will try to arrange an interview and see if we’re meant to flock together. So what do you think? 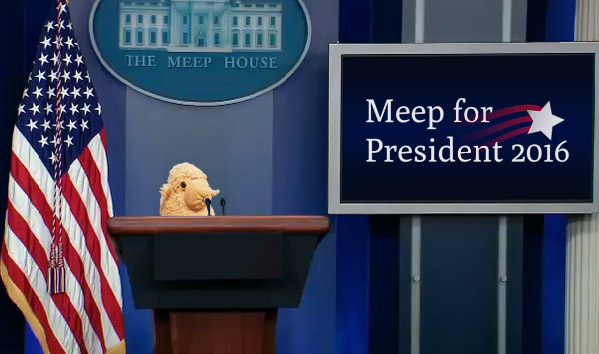 Who do YOU think would make a great Veep for Meep? ?